Jennifer Alexander helps women change their lives through daily actions. Within the pages of Jennifer Alexander’s new book, Digging Deeper Day by Day Devotional, ($19.49, paperback, 9781498460880; $8.99, e-book, 9781498460897) readers will find a women-centered daily devotional that uses the wisdom of the Old and New Testament stories to address modern-day concerns. With keen insight into the everyday needs of female Christians, it highlights God's straightforward answers about marriage, relationships, faith, forgiveness, love and more. Jennifer Alexander has a Master’s Degree in Social Work and has taught Women's Sunday School/Women's Bible Study in various churches around the world. Xulon Press, a division of Salem Media Group, is the world’s largest Christian self-publisher, with more than 12,000 titles published to date. 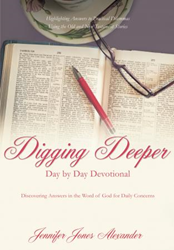 Retailers may order Digging Deeper Day by Day Devotional through Ingram Book Company and/or Spring Arbor Book Distributors. The book is available online through xulonpress.com/bookstore, amazon.com, and barnesandnoble.com.